Unf. - I see better from a distance. 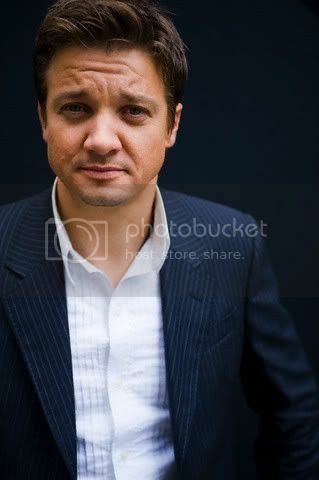 Please stop, Mr. Renner. You're killing your fangirls!!!! More Jeremy (non-Bourne Legacy) under the cut. Lots of UNF today. This one is probably from around the time S.W.A.T. came out. I love his cute puppy dog face. Don't ya just want to pat him on the head? I think this is one of my favorites. He almost looks like he's praying! You're slaying me. Unf is right. Wasn't Neo Ned sweet? I really enjoyed that film. Honestly, the guy's a chameleon; watch Dahmer, then that, then MI:TGP. Different bloke, surely. I didn't expect that Neo Ned would make me cry. I'm still a little scared about watching Dahmer. Chameleon is right- he can play almost anything. I still say he was robbed of the Oscar for The Town- as much as I loved Christian Bale in The Fighter...2010 was a tough year for Supporting Actor. Mark Ruffalo was nominated in that category that year, too. Ouch.